I had some serious doubts about this band judging from the front cover. As you can see from the cover, Boned makes no secret about their affection for AC/DC. The band actually changed their named from AC/DD to Boned to avoid being confused for an AC/DC tribute band. I’ve heard many AC/DC clones over the years, very few of which I consider worthwhile. Dirty Looks and Rhino Bucket are two bands that got it right. In fact, most “clone” bands simply come across as second rate to me, inspiring me to spin a few discs from the original band. 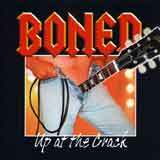 Much to my surprise, Boned have honestly mastered Bon Scott era AC/DC, making this disc a great listen. There is nothing original about this band, not a damn thing. However, this has got to be the closest thing you’ll ever hear to Bon Scott fronted AC/DC material these days, and that counts for something in my book. Boned is made up of 5 die hard AC/DC fans, but 4 of them cannot be named due to contractual obligations. Dan Davie is listed as the rhythm guitarist, the others are anonymous. As I alluded to earlier, Up At The Crack stands up very well on its own. This isn’t some second or third rate copy-paste job that motivates you to toss the disc out the window and go listen to Highway to Hell instead. This album is loaded full of energy and sleaze, more so than even the AC/DC of today. Track titles such as Drain the Main Vein and Ain’t No Talkin’ With Your Mouth Full are great sleazy, party rock tracks that parallel some of the tongue in cheek lyrics of AC/DC past. The chord driven rock of Boned has not been given a down tuned treatment, or otherwise doctored up to sound modern. The sound is actually stripped back, raw, and very much in your face. As a result, the sound quality certainly has a retro feel to it, further linking themselves to the AC/DC of old. I have to say that the guitar work is catchy as hell. This is a disc that I could easily listen to more than once straight through. The lead vocals are strikingly similar to Bon Scott, maybe a tad grittier though. There are even a couple of semi spoken vocal passages, just like Scott used to deliver (i.e. Dirty Deeds Done Dirt Cheap). The guitar solos are flamboyant and energetic throughout the album, making for a solid album start to finish. Each of the tracks on this album is a fun listen, with none of the material falling into the “filler” category. Just one minor technical observation: I noticed a couple of instances where the lead guitarist fell a bit behind tempo wise. This isn’t something I found severe enough to ruin any songs, but it sounds a bit clumsy if you are listening closely enough to pick up on it. In all honesty, the energy and fun party vibe that emanates from this album will attract most of your listening attention. Aside from this, it sounds like Boned is comprised of some talented veterans of the rock/metal scene. It may be years before we figure out who the lineup of Boned actually is, but I am guessing that they are fairly well known names. While anything but original, all the songs are of a consistently high quality, keeping my neck moving start to finish. Despite a small handful of subtle technical goofs, I have no complaints with this album. When I first saw the cover of this album, I thought this was going to end up being a “Crap of the Month” joke. Despite the glaring lack originality, this is an excellent nod to a passed, but never forgotten era of AC/DC. The quality of these songs certainly stands up to that of their mentors. Some may say that this album is a Touch Too Much like AC/DC, but you can’t deny that Boned have Big Balls for taking us on this Highway to Hell, refusing to be Shot Down in Flames.